The first stop of our spring trip was at the Delicate Arch in the Arches National Park. Delicate Arch is the most famous arch in the park and may well be the most famous arch in the world. Its unoriginal rendition at sunset is a dream of many a nature photographer, myself included. As it appears, in late March, it is a popular sunset spot for a few too many non-photographers who make a 1.5 mile trek from the Wolfe Rach parking area up over slickrock toward the arch. 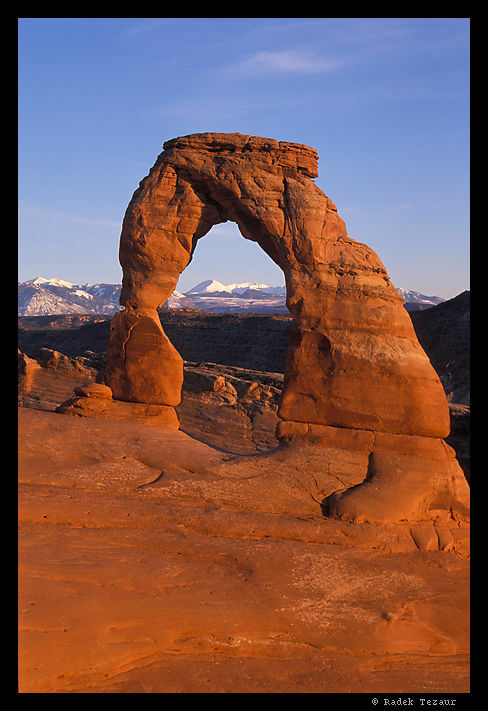 The Arch itself is situated at 4830ft above sea level in a distinctly arid continental environment, where weather extremes that have contributed to its creation are still the norm. The La Salle mountains, that carry snow for a good part of the year, provide a great contrasting backdrop for the arch.